This is an artwork by Patsy Paterno. "But be examples to the flock." In our life, there will be instances that we will show leadership among other people. It can be just by taking initiative in doing the dishes or feeding the pet. It can also by volunteering to charitable activities in the community. Encouraging others or teaching them also show leadership. We must remember that in doing so we must show compassion and inspiration. We should be a role model and not be high and mighty because we are knowledgeable. We must keep our humility even we are in high positions. We are just humans and also belong to the flock. And only the Lord is the Greatest Shepherd. God is almighty and powerful. He assigned Peter to be the shepherd of the Church - God's people. We are God's people. The Lord gave authority to Peter to oversee us. To evaluate who will bind or who will be loosed in heaven. Personally I wanted to be included in heaven. A sheep must follow the shepherd. I am the sheep and the Lord is my Shepherd. He is my leader. I must obey and follow Him. 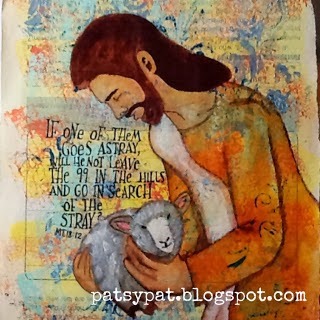 For this I pray, "Dear God, help me to become a good shepherd to the people around me. Make me inspire them and draw us closer to you. Give me a humble heart to always remember that everything I do is always for You. As I lead them, You are my Shepherd. Teach me to follow your ways always. Please pour upon me the Holy Spirit that I will only do things that are in accordance to Your will. Amen. "